Famous for their oysters and fresh crab dishes. They shuck and crack seafood right in front of you. Yes this place is popular, but it's also tiny. There are only a handful of places to sit, about 18 stools, and that’s it. 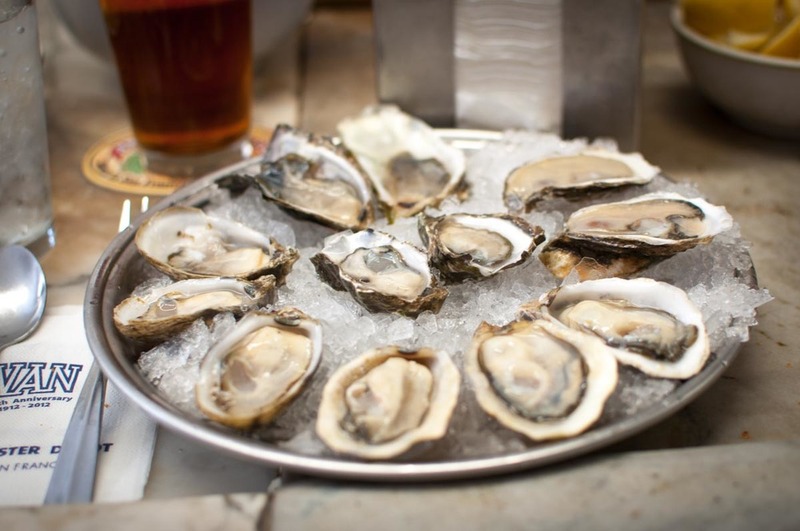 When oysters are fresh, they have a brilliant sheen to them. Opened in 1912, it’s been run by the Sancimino family since 1946. Swan Oyster Depot is a place that always tops people’s list of restaurant recommendations in San Francisco. Don’t fear the hypers, because this is a place that lives up to its reputation. "For cracked crab, oysters, clam chowder, and they make their own vinegar, which is great with oysters." "For a true old school San Francisco seafood experience." "Amazing fresh selection of seafood." I started working here when I was in high school. I went to college, got a degree and mulled over the idea of doing something else. But I think I have the best job in the world. My grandfather Sal bought the business in 1946 with his cousins. The original business model was that two of the cousins were going to do the fishing. My grandfather and his cousin Pat were really close in age, almost like brothers, they were going to run the retail shop. But the two cousins who were supposed to fish never really spent any time fishing. After about two years my dad and Pat said, “Here’s your share of the business. We want the store.” Today, there are seven family member who still work here. Picking a good time is key. Come early, late or during the week. It also helps to be in small numbers. But if you’ve got a group of four or five, I’d say come during the week at 10am in the morning or 4pm in the afternoon. But if you come on a Friday or Saturday during the day, it’s a great opportunity to get to know somebody while you are waiting in line. If you are on a date with somebody you hardly knew, you can stand around talking with them for about an hour, it’s perfect. You can make friends with people in line. We have people coming in all the time and I look at them and say, "So you guys are all four together?" "No we just talked in the last hour. We feel like we’re together now." People ask us why we don’t franchise and make some real money, but I think the fact that we haven’t done that is one of the things that makes it unique. My dad and uncles could’ve easily said, ‘"Okay, what we’re going to do is buy an office and teach people how to do this and we’ll just watch the money roll in." But that’s not really what they enjoy about the job. They like the work. They like having their hands in it and they like the people aspect of it. If we expanded, it would be totally different. You wouldn’t be able to walk in and see the same guys you’ve seen for 50 years. Tuesdays, Wednesdays and Thursdays are great days to see the regulars. On Friday and Saturdays, sometimes you go two hours before you see a face you recognize. A lot of our locals will drive by to if they see there’s no line, then they’ll just pop in. It doesn’t happen too often, but in the last year I’d say it’s happened more than I can ever remember before. Recently, I looked up and there was Anthony Bourdain. No cameras, nothing, just Anthony Bourdain sitting at the counter having lunch. One Saturday morning, at about 8 o’clock, somebody called and said, "Hey, I know you guys don’t open at the counter until 10:30, but I’ve got a pretty famous guy with me right now. He’s got an entourage of about 10 friends. They’ve been up partying all night and they want to come eat. Is there any way you can make a special exception?" We asked who it was, they said Bono. I was thinking "yeah, sure, Bono’s not coming in." Sure enough, Bono walked in with about 10 friends. They’d been up all night and they were really nice, delightful, fun people. Swan Oyster Depot opened in 1912 and it’s been run by the Sancimino family since 1946. Two cousins were responsible for the fishing and two ran the retail shop. Today, it’s the sons and grandsons behind the counter. Kevin Sancimino is the third generation working the counter at Swan Oyster Depot. Chef Joji Sumi creates a monthly pop-up dim sum restaurant in San Francisco. He gives you his perfect day in the Bay Area.